I'm not a racer but do like the more aggressive posture from clip-on type bars and rearsets. I plan to do this mod when time and funds allow. 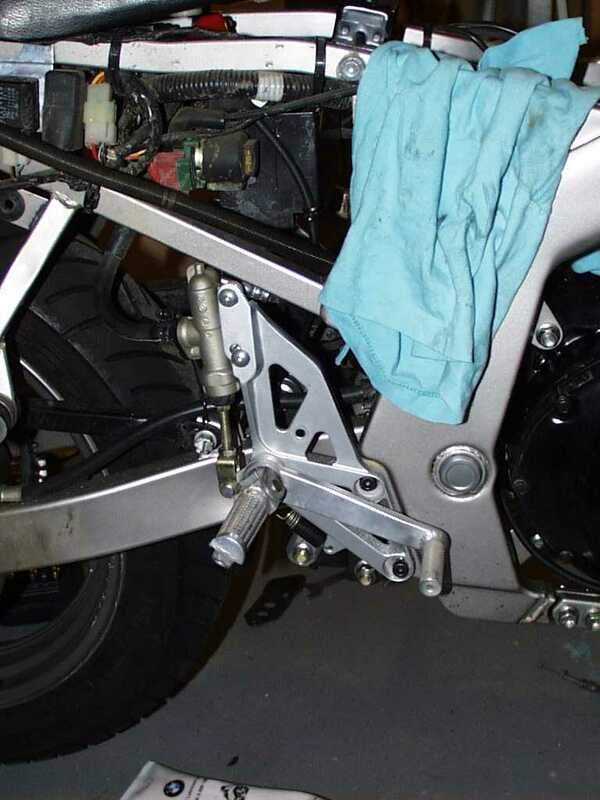 Kevin used '93 GSXR 600 rearsets ('92-'95 same, '96 newer do not work). re-mount the master cylinder down lower, and straight. A small angle is not at all critical though. The rear master cylinder mounts on the brake side by rotating the banjo bolt. All the shift linkage parts come with the rear-sets, and the only thing you have to do is make a longer shifter rod. Extended a stock GSXR shift rod by welding in a section. 244 mm. for a race shift pattern (1 up, 5 down), or 222 mm. for a normal street shift pattern. They are nice aluminum cast parts, and are much lighter than stock. They are 4 lbs. lighter overall, combined left and right side; the brake side alone is about 600 grams, vs. 1600 for the stock parts. That's 2.2 lbs. lighter! The pegs are about 1 1/4" higher, and 1" further back. There is tons of cornering clearance. 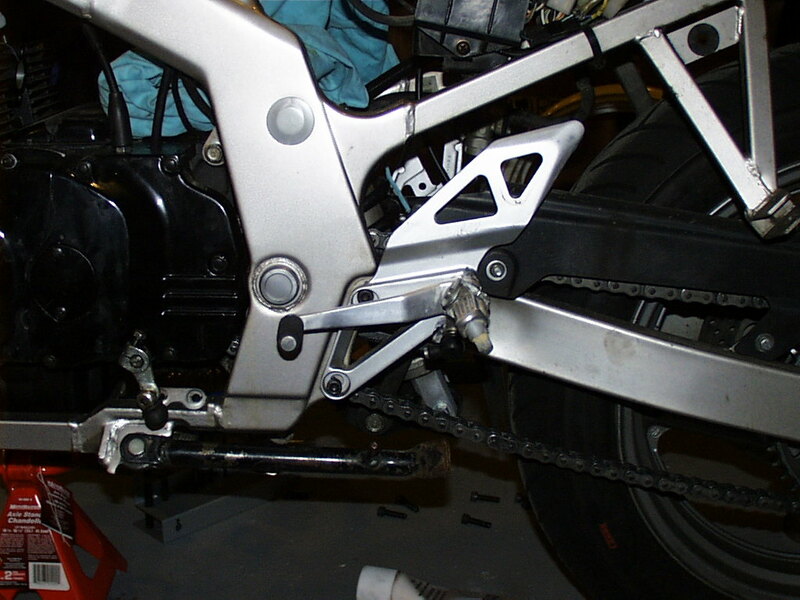 Another option provided by Bob Broussard of GStwin.com : I used stock rearsets for a CBR 900rr. Not sure what year, maybe 96 or 97. The bolt pattern is so close a little filing on the holes did the trick. The rear master cylinder fit like it was made for it. I had to take the stock shift lever and cut it off. Then drill a hole on the piece that clamps on the shift shaft. Thread the hole, and bolt on the linkage from the shift lever on the rear set. Special thanks to Kevin Caldwell from Canada for the GSXR info and Bob Broussard for the CBR info.